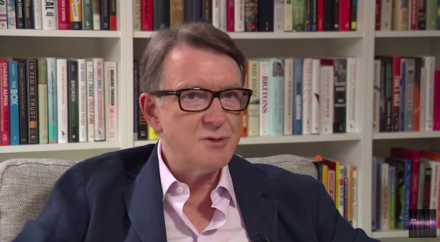 These are the opening remarks by former business secretary and ex-European Commissioner Lord Mandelson, an Open Britain supporter, when he took part in an event on Brexit at the Institute for Government. The prime minister has made two pivotal decisions which will determine the shape of Brexit:. First, to leave the single market to pursue a free trade agreement completely outside the EU. This will add time, complexity and risk to the negotiation. Second, her negotiating strategy is framed by a series of red lines which, on the face of it, will severely restrict her negotiating flexibility. We know where these red lines have come from and the PM will face a choice: between the trade deal essential for the economy and the right wing of her party who want Brexit at any cost. A choice between economic reality and political intransigence. The EU, in response, has set out draft negotiating guidelines which offer a route towards a comprehensive trade deal. It’s their olive branch. In effect, they are saying to Britain ‘you can have your deal but you will have to respect our rules to get it’. In other words, if we meet you half way, you will have to do the same. The prime minister asked for a proper negotiation and the EU are giving her one, first the withdrawal then the re-engagement. Over time these discussions will overlap. She always knew the terms on which the EU would negotiate because officials in UKREP, the FCO and DExEU spelled them out. There are no particular surprises in the guidelines, Gibraltar apart. I hope the EU will be reasonable and business-like. The question is, will the prime minister’s party allow her to act similarly or tie her hands? Payments. The PM says Britain will cease to make “large payments” to the EU, but their guidelines make clear that they expect “a single financial settlement” to be paid for our outstanding liabilities, which will come alongside continued payments as a member and future payments for participation in EU programmes and agencies. Timetable and transition. The EU says we will depart in March 2019 but that a trade deal could only be completed and ratified once the UK has left and become a “third country”. There will therefore have to be a transition period after 2019, which the EU will limit to three years. ECJ. In a transition period the UK is likely to have to remain under the jurisdiction of the ECJ, directly or indirectly, perhaps in a structure like the EFTA Court. And even after this, under the terms of a FTA, the EU has made clear that it expects a level playing field in rules governing competition policy, state aid, fiscal, social and environmental standards. This will limit Britain’s regulatory freedom and be subject to arbitration by the ECJ or its equivalent. Free movement. Any transition period that maintained the status quo in trade would mean retaining the four freedoms, including freedom of movement. We can decide not to do this, but this will come at a cost of restricted market access in services. International trade agreements. Britain may have to delay the start of actual negotiations for new deals with other countries until after we are through the extended transition period. The wild men in her party have already started to agitate against accepting any such terms which they think would amount to a bad deal. They claim that no deal would be better than a bad deal – that ‘no deal would be absolutely OK’, in the foreign secretary’s words. WTO tariffs imposed on around 90 per cent of the goods the UK exports to the EU, including 36 per cent on dairy, 15 per cent on food, 11 per cent on textiles, and 10 per cent on cars. Customs checks and inspections which would be lengthy and costly. There would be costs for European traders but, given that half our exports go to the European market, the economic consequences for Britain would be much greater. I do not think leaving without a trade deal in prospect would receive parliamentary approval. The impact on market confidence, on interest rates and the cost of borrowing, and on the value of the pound would be severe. The most vulnerable, the most indebted, the ones with the least to fall back on, would suffer fastest and most. To those who say we have to countenance no deal as a negotiating tactic I would say threatening to shoot yourself in both feet is not a credible negotiating tactic, it is a sign of insanity. Threatening the EU on security co-operation has already gone down badly. To withstand the internal party pressures on her, the prime minister clearly needs broad political support. She needs weight placed on the other side of the scales. In particular, it is the moral duty of other Brexiteers in the Cabinet to weigh in and challenge those who claim that no deal would be fine. She has to be honest about both the compromise needed to achieve a deal and the consequences of not getting it. Such honesty would be a sign of strength and determination, not weakness. Above all, she has to make clear the national interest comes first and that a trade deal is necessary to secure this. Based on my experience as a member of the commission, I believe her straight dealing would be reciprocated on the EU side. It would create a positive momentum. It would help build trust in the negotiation. If she fights for her position against those wishing to drag her further away from it, most of the country will back her. It would be churlish for people like me not to wish her well, even though I think an FTA is a clear second best to staying in the single market. Those on the Leave side should not tie her hands in negotiations and those on the Remain side should back her up, while not giving a blank cheque. The trade deal must be meaningful and not a matter of political optics. If she gives in, she will only have herself to blame when the awful reality of our position dawns. There will then be no blaming the Remainers, Remoaners or the EU. She will have brought this on herself. So as the negotiation gets underway, the Prime Minister faces a fork in the road. A huge amount is riding on her choice, to stand up to the pressure or see her position erode. We have to hope she takes the right course. Peter Mandelson was appointed Secretary of State for the Department of Business in October, 2008. Prior to taking up this post, he was European Commissioner for Trade for four years and Secretary of State for Northern Ireland between 1999 and 2001. Peter has vast political experience at every level. He was elected to Lambeth Borough Council in 1979, was director of Communications for the Labour Party in the 1980s, and served as Member of Parliament for Hartlepool between 1992 and 2004. He was also a key architect of New Labour and ran the party's landmark electoral campaign in 1997. Aside from his achievements in politics, Peter wrote the successful 1996 book The Blair Revolution, and is a regular contributor in The Guardian.